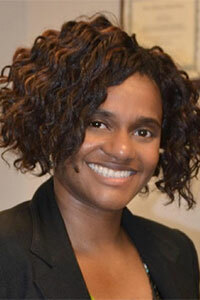 Tomeico Faison received her Master of Science degree in occupational therapy from the UNC at Chapel Hill in 2001. Two years into her career, she founded Therapeutic Solutions (www.therapeuticsolutionsofnc.com) to meet unmet community-based needs and began contracting with group homes, community-based agencies and state facilities. Her dedication to the profession of occupational therapy and innovative community-based practice are noted with special award recognitions, including the Marlys Mitchell Pioneer Award recipient at graduation in 2001 from UNC-CH and the Nova Award from the NC Occupational Therapy Association in 2003. To better serve the growing population of persons with low vision, Ms. Faison completed a graduate certificate in low vision from the University of Alabama at Birmingham in 2009 and then added this specialty area of practice to the company which has grown from one to over eighty referring providers in five years In 2016, Tomeico completed a certificate in business coaching from NC State University and officially added consultation and coaching services for aspiring health and human service entrepreneurs (www.faisonconsulting.com) as well as universities and facilities/agencies across the nation who want to add innovative programs and services to help underserved populations. In her spare time, she enjoys writing, motivational speaking, jogging and spending time in ministry and with her family. Ms. Faison will be co-teaching entrepreneurship modules within the seminar series and community-based practice course for the Rocky Mountain College, Occupational Therapy Doctorate Program.